$135,000 was raised for Project Renewal. least for the next wave. Spotlight on the Middle East. .
countries for nearly 19 years. Jan. 19, at the Temple, 200 S.
cent Israeli and U.S. meetings. All lectures will begin at 8 p.m.
and will be held at Beth Israel. Donations for the series is $10. the Temple office at 421-7060.
side U.S., add $10 (remit in U.S. funds). U.S. investors. Full refund if not satisfied. achieving a settlement, he said. fly them directly to Israel. donment of the Jews by David S.
that some of the "moderates"
organization's recent convention in California. 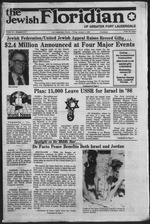 Aires on a special extradition from West Germany. by the Greater Hartford Jewish Federation. "Who is caring for our future,"
tion efforts in Mexico City." place on education and culture. should help Mexico in this area. "For more than 20 years,"
Mexican Jewish com m unity. in the best Judaic tradition. of responsibility one for another." Strategic Studies in London. Dr.
it to the forefront of arms control. threat of a first strike. and Yarmuk rivers to both countries. which is vital to the west bank farmers. Arabia for medical treatment in Israeli hospitals. again in 1975 through unofficial contacts. has been possible only because it is unofficial. As proof, they cite the experience with Egypt. w' ^vent him from doing so too quickly. written peace treaty at this time. ly reflect the opinion of the Jewish Federation of Greater Fort Lauderdaie. limit costs and increase revenues by some $600 million. cuts defense spending another $300 million (to below 30 percent). "We're not through yet; more cuts are planned." unless accounts are held for a year a savings incentive. * Labor will continue to suffer layoffs and face wage rise limits. foreign currency reserves are low, $2.3-billion. help only if we do. Make your gift to the Federation/UJA campaign now! settlement and ultimately to peace. associations of legitimate Palestinian leaders under a microscope. way to bar their participation. he is prepared to talk about any issue the Arabs want to bring up. poanbly, agreements can be reached. Aawd nay believe that Peres is just playing to the world media. they are so reluctant to respond to Peres' challenge. The ball remains in their court. populations of more than 5,000.
a struggle "not to disappear." of the Fonds Social Juif Unifie. cil of Jewish Community Services. the Holiday Inn, State Road 84.
and fighting for human rights. advisor to the Ministry of Health. award in recognition of his work. peared and find the guilty parties. delegates of the member Federations. tions imposed upon Prisoners of Zion. meeting of U.S. President Reagan and Soviet leader Gorbachev. Soviet initiatives on this issue. ding to Dan Klein, Division chairman. mission of the Disappeared find? pearance of at least 9,500 people. fected by arrest, torture or death. front of his parents' eyes. could neither sit nor lie down. taken, there must be a reason." rested because they were Jews. who helped save hundreds of lives. Were yon immune from arrest? thought a rabbi had to respond. Neither was I immune to fear. the coward is not fearlessness. tivity. That tactic was a mistake. Church do to defend the victims? felt the wrath of the hierarchy. camps. What were they like? a cellar and kept there for years. knowing what the military did. tina. They consider it their home. than is North American Jewry. '86 campaign the best ever, Mr.
cocktail party, Tuesday, Jan. 7.
for their hard work and dedication to Jewish causes. Lucille Stang and Leo Weissman. Sybil Hecker and Rose Dickst*i"
honor Nathan Denenberg and Dr.
Jewish needs at home and abroad. "Inverrary has a soul," he said. man; and honorees Joseph and Ida Kaplan. St. Louis, Kansas City, Mo. Lime Bay was required for attendance. Board Meeting. 9:30 a.m. At Federation. Jan. 8 Business Executive Network. $10,000. Home of Anita Perlman. Jan. 12 Oriole Gardens II. 10 a.m.
Jan. 12 Oceanside Division. Noon. Jan. 12 Bonaire Meeting. 7 p.m.
Feb. 13 Century Village Luncheon. Gifts Event. $100 Minimum. 7:30 p.m.
Temple, 4099 Pine Island Rd. Association Phase I: 7:30 p.m.
North Broward Midraaha: 8 p.m.
Ballroom, 5460 N. State Rd. 7. Savings, 3000 N. University Dr.
Center, 9101 NW 57 St.
Park Pavilion, 5803 Park Dr.
ple, 1880H W. Hillsboro Blvd. Sunrise Lakes Phase I Playhouse. muda Club: 11:30 a.m. Meeting. turist Dr. Zin You will speak. University on Wheels. 10 a.m.
quietly eating our dinner meal. and more simple in ways. to forget each others name. that was unable to mend. to look back at me. he picks up a fork. to further put on the shelf. Dr. Clifford Golden, Edt D.
denied that he had ever extended such an oner. period January through November totalled $3,719 billion. Diamonds were up 21 percent totalling $1,161 billion. the Hebrew University of Jerusalem Faculty of Medicine. was presented in the Main Office of ARMDI in New York. cated in virgin timberland at Hot Springs, Ark. years ago, long before polution. the only water popular across the nation. "Women's Conflicts in the 80's,"
Wednesday, Jan. 8 at the JCC. find time for self fulfillment! Computer language to be exact. and 14, March 12 and 14.
count, if you're over 65. "shut-in" residents of the homes. tive member of JWV William J.
put a value on the find. not used were found nearby. from a proposal by U.S. Rep.
Blanche Bombart, Community Volunteer Service chairperson. Music, Ben Kimelman, accompanied by talented Bess Levy. $20 billion per year," Rabin said on his recent Washington visit. take too many (more) risks for the security of Israel." tional unity government made the austerity program possible. for inflation, for fiscal 1987.
torial selections will be presented. Congregation to the Hebrew Day School is Mr.
funded by the Federation/UJA campaign. Biblical discoveries of our time? required to recite each day? 3- What does the word "Torah"
in the broadest sense encompass? Prophet Isaiah (all 66 chapters). and genius from Mount Sinai. ty of saving human life." worshipper who is thus honored. after it has been read. Posner, son of Dr. Gail and Dr.
vices: Friday at 8 p.m. and Saturday at 9 a.m. Rabbi Joaiah Derby. day 8:45 a.m. Rabbi Kurt F. Stone. Auxiliary Rabbi Nathan Zolondek. Cantor P.
TEMPLE BETH ISRAEL (742-4040), 7100 W. Oakland Park Blvd.. Sunrise, 33313. Blvd., Deerfidd Beach, 83441. Services: Sunday through Friday 8:30 a.m., 5 p.m.
Joseph Langnsr, Castor Shabtal Aekanaaa. TEMPLE B'NAI MOSHE (942-6380). 1434 SE 3rd St., Pompano Beach. 33060. Services: Friday 8 p.m. Cantor Jehudah HeUbraaa. TEMPLE SHA'ARAY TZEDEK 741-0296). 4099 Pine Island Rd., Sunrise, 33321.
day 8:46 a.m., 6:30 p.m. Cantor Jack Marchant. Friday service 8 p.m. Saturday 8:45 a.m., 5:30 p.m. Cantor Joel Cohen. 8:45 a.m. Rabbi Israel Halpern. NORTH LAUDERDALE HEBREW CONGREGATION (722 7607 or 722 2722). p.m., Saturday 8:45 a.m. Charles B. Friar, President. TEMPLE OHEL B'NAI RAPHAEL (733-7684), 4361 W. Oakland Park Blvd..
8 a.m., 5 p.m., Saturday 8:45 a.m., 5 p.m. Cantor Panl Staart. a.m.. 5:80 p.m. Stady groups: Men, Sundays following services; Women. Tnesdays 8 p.m. Rabbi Aron I.ieberman. Saturday 8:45 a.m. and sundown. CONGREGATION MIDGAL DAVID 726-3683). 8676 W. McNab Rd., Tamarac. bi Chain. Schneider. Congregation president: Herman Fleischer. Rabbi Nathan H. Fish. Cantor Morris Levinson. Bat Mitzvah. Rabbi Jeffrey Ballon. Cantor Rita Shan. day 8:15 p.m., Saturday 10:30 a.m. Rabbi Sheldon J. Hair. Cantor Gene Carbarn. Creek Parkway. Rabbi Brace S. Warshal. Cantor Barbara Roberta. evenings at 8 p.m. Cantor Richard Brawn. , V \ T .*'.. <* i* . April 12 at the Hyatt Regency Hotel in Houston, Texas. Chairman and mentor Carl Grossberg. collaborators following World War II. Conference will be held Jan.
Joshua. By Joseph A. Kornfeld. This is the job that Joseph A.
ford University Press. 269 pp. an editor would have corrected.